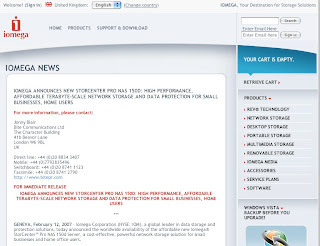 While working in London for Bite Communications, I also did some PR for prestigious data storage specialists Iomega. My time in PR was taken up largely by Apple, Sonos and CPP, but every now and then, my monthly hours on my timesheets would include Iomega, a leader in data storage, based in Switzerland. It was deemed that I would do some good work for Iomega given that I had done quite a lot of technology PR in my first few months working at Bite. However time spent on Iomega was hard to find, as I squeezed my hours to fit my schedule, or more often than not, I stayed late in the office. I didn’t know a lot about Iomega to start with, but workmate Paul Thompson showed me all the products we had, and the new releases. I sent some of the press releases out, and for a month or so, became the UK point of contact for Iomega. I worked alongside Paul Thompson and Clare Gayner at Bite to do this, and although they often chased me for coverage, it was actually quite easily run. The journalists all knew about Iomega. What did I do – Sent products out to journalists, phoned journalists, sent press releases, took enquiries and helped with the account maintenance in house for Iomega. This entry was posted in Bite Communications, Daily Features, England, Europe, Jobs, London, Public Relations, Working Wednesdays. Bookmark the permalink.